BEIJING - As a scholar and an internationally recognized financial official, Zhu Min, special advisor to the managing director of the International Monetary Fund (IMF), brought the view of emerging markets to this important institution. 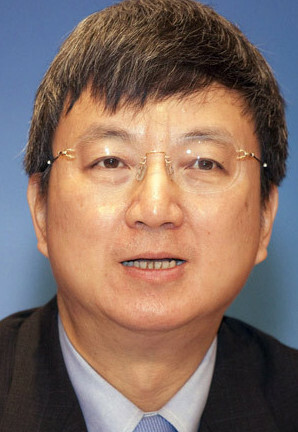 Zhu Min, special advisor to IMF Managing Director. Zhu's influence in the organization appears likely to grow since media reported on Thursday that he is a strong candidate for a deputy managing director post to be created by the IMF's new chief Christine Lagarde, according to insiders. "Zhu is expected to be named to be deputy managing director of the fund," Reuters cited an unnamed IMF board member as saying. The deputy managing directors often chair board discussions on lending decisions in the managing director's absence. The appointment, if approved by the 24-member IMF board of member countries, would give China one of the top five management jobs at the IMF and Asia two senior management posts, plus the chair of the IMF's top advisory committee, which was recently filled by Singapore Finance Minister Tharman Shanmugaratnam. During Lagarde's first news conference as managing director of the IMF, she vowed to give developing nations a greater role in the fund. She said she was considering creating a high-level job that would be filled by a candidate from an emerging market country. The move, experts believe, is to better reflect developing countries' growing economic clout and let them have a bigger say in the international financial institution. On Feb 24, 2010, Zhu was appointed as special advisor to the IMF's managing director, in a move to strengthen the body's understanding of Asia and emerging economies and to promote sustainable growth and financial stability. Zhu was the second Chinese to hold a senior position in a top international financial institution, after Justin Yifu Lin, who was appointed vice-president and chief economist of the World Bank in 2008. Since the global financial crisis, China has been playing a more important role in the international community and the IMF also said that it called for giving more votes to China. Zhu's experience in important financial institutions at home and abroad makes him the right person to represent the country's financial sector internationally, experts say. "Zhu was very familiar with the rules and ways of operation of international financial institutions, putting him in a better position to protect and strive for China's interests," said a manager at the Bank of China who wished to remain unnamed. Before joining the IMF, Zhu was a deputy governor of the People's Bank of China. He was responsible for international affairs, policy research and credit information. Before his service at China's central bank, he held various positions at the Bank of China, and left as executive vice-president, responsible for finance and treasury, risk management, internal control, legal and compliance, and strategy and research. Zhu also worked at the World Bank as an economist from 1990 to 1996, and taught economics at Johns Hopkins University and Fudan University. After Zhu assumed his position in the IMF on May 3, 2010, he brought something new to the institution, as partly evidenced by the form and content of its annual meeting. The routinely six-day meeting was shortened to three in October 2010, and the official speeches from more than 100 countries' ministers were replaced by six focused sub-forums. As a major organizer of the meeting, Zhu contributed to the change. According to a foreign correspondent, Zhu was well respected in the international financial community because of his down-to-earth attitude. "Meanwhile, he also has the courage to present and address thorny problems," said the reporter. Almost all the people who used to work with Zhu said he was very easy-going. And in his spare time, Zhu is a great lover of books and sports. Zhu received an MA and PhD in economics from Johns Hopkins University, an MPA from the Woodrow Wilson School of Public and International Affairs at Princeton University, and a BA in economics from Fudan University.